The “back to hieroglyphs” meme, it’s one of those memes that won’t die. But is there any truth to it? Today on Beyond Bones we’re going to find out! Although our increasingly complex and diverse store of emoticons may visually resemble the famous script of the ancient Egyptians, in truth emoji’s are a lot more primitive. Emoji’s can only do one thing: communicate a vague concept about an object, activity or an emotional state. They are literal pictorial references to whatever you are trying to refer to. Hieroglyphs, on the other hand, can do a lot of things. 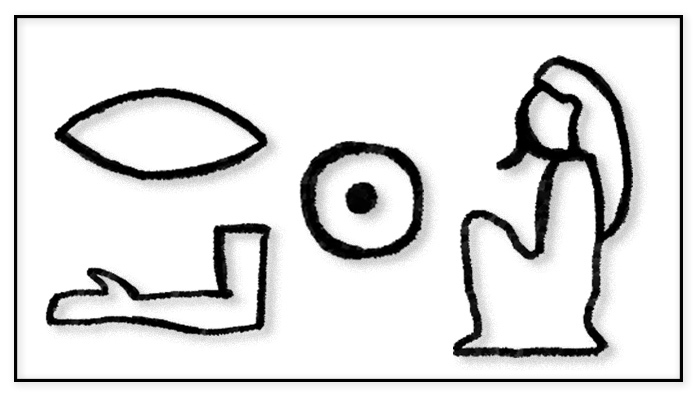 Some hieroglyphs represent phonetic sounds, just like letters in our modern alphabet. Others represent entire syllables, usually these syllables derive from whatever object they represent pictorially. Still others can represent either a sound or simply whatever they are a picture of, a bit like emoji’s do. The the solar disk with the dash under it is called a determinative, it’s there to indicate that we are referring to Ra the sun. Determinatives were often used in hieroglyphic texts because many hieroglyphs have more than one meaning. Placing a symbol at the end of a word that indicates what is being referred to helps solve this problem. You can add a little man-shaped determinative to indicate that we are talking about Ra the god. This is a super basic example of how to use hieroglyphs, but at least it’s a good introduction to how the writing system works. Now let’s talk about hieroglyphic emojis. We’ve used a combination of phonetic sounds and ideographic symbols to create a word. Ideograms, such as the sun disk or little man, as used in Egyptian hieroglyphics function a bit like emoji’s do in modern usage: to clarify the meaning of a statement. 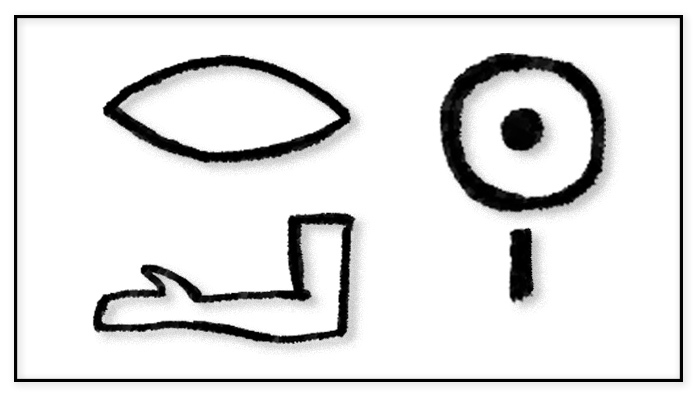 So some Egyptian hieroglyphics are like emojis, but the writing system as a whole is much more complex. 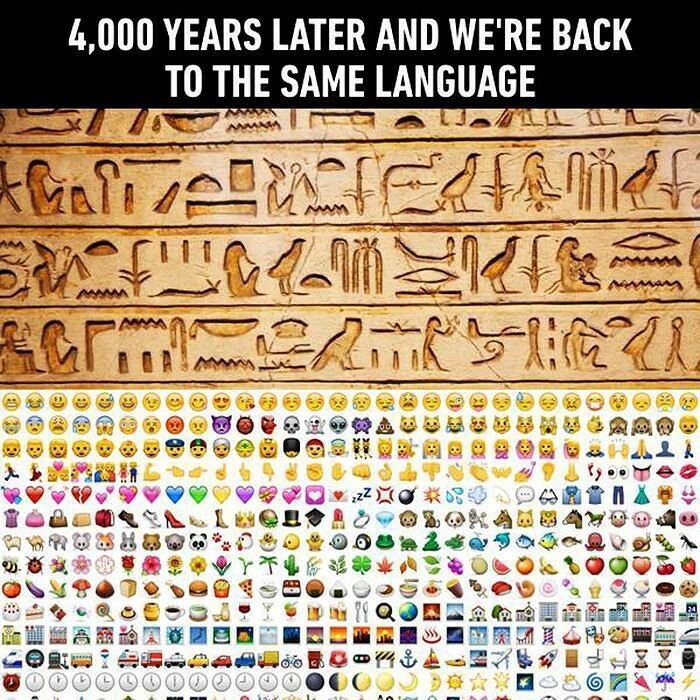 Still, the fact that emojis are modern ideograms and that we use them much like the ancient Egyptians did thousands of years ago is intriguing. For the Egyptians, the ideograms allowed them to work around the limitations of their proto-alphabet. For us, they allow us to work around the limitation of only being able to use our thumbs to type. It’s the same solution to different problems. But does this mean that our dependency on technology is causing us, the human race, to regress to a simpler form of written communication? I’ll leave that for you to decide. One more thing about hieroglyphic emojis: sometimes we use emojis just because they’re cute (i.e. puppies). The ancient Egyptians did something similar. Scribes would often carve unnecessary derterminatives into whatever they were inscribing on a monument to fill out any empty space and create a more aesthetically pleasing facade. So there you have it. The infamous “back to hieroglyphs” meme is an insult to ancient Egyptian scribes. Although they had something like emojis, the ideographic symbols were a small part of their complex writing system. Ancient Egyptians could communicate with precision anything they chose to with their hieroglyphics. And trust me, they did… In our Hall of Ancient Egypt we have on display a preserved message from the chief of police of the worker’s village in Thebes instructing his servant to “find a he-goat for my woman who is ill and take possession of it”. Can you say that using emoji’s? I think not.